In caves and lairs around Granada, Flamenco still thrives in its natural habitat. Bypass the dozens of tourist tablaos in Sacromonte and head straight to the following bars and clubs where locals, students, aficionados, and most importantly, flamencos themselves can be found taking in a late-night show. Only a name painted on a white wall tells you which dark alley to turn down. The place is a smoky vault of underground chambers, age-old posters of flamenco legends gone by, and fiendishly hot line-ups of musicians and dancers. The program can be a bit erratic. Unless they advertise a concert, assume you will just have to turn up and hope for the best. They do however keep a closely guarded canon of artists, many of whom spring from the great flamenco families of Granada, and also regularly showcase flamenco fusion. This above any other joint in town is where you’ll rub shoulders with the real deal. 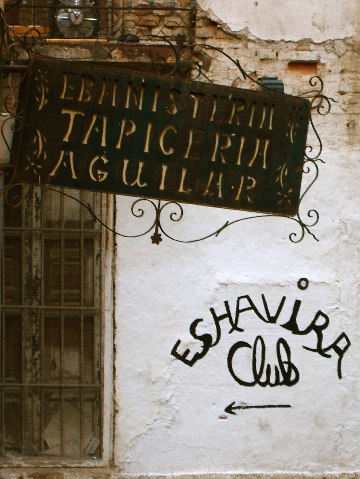 It seems almost sacrilegious to give second billing to the oldest flamenco club in Spain. Inaugurated in 1949, the Peña was the first of its kind, a place run by flamenco aficionados with the aim of supporting and nurturing the art rather than making money. The Peña only throws open its doors on Thursday nights, for an astonishingly reasonable €8 including a bottle of local tipple Manzanilla. The performers are hand-picked from the finest resident or visiting artists, and the show is definitely more serious spectacle than underground fiesta. Across the Darro river, in the shadow of the Alhambra, Huerto del Loro’s out of the way location makes it less hit by tourists. It’s one of the cheaper flamenco clubs as well. (Remember that a cheaper cover doesn’t mean a weaker line-up – in fact the opposite: no self-respecting local is going to pay through the nose for a flamenco package deal when they can spend €8 to see the same artists here in a more relaxed environment). The vaulted theatre is a dingy but warmly lit cave, with a simple lilac flamenco shawl as its backdrop. With a regular program of artists in rotation, some of the best include the seductively named Caramela la Chocolata, and local favorite Pilar Fajardo. The central location means that this narrow whitewashed cave can sometimes get a bit touristy – and the performances tend to sag a little when there are more flashbulbs popping than audience encouragement. Still, Upsetter plays host to some phenomenal resident performers, including Sergio ‘El Colorao’, who last year won the soleá prize at the prestigious annual flamenco festival in La Union, Murcia. Monday nights are a must for the raucous combination of guitar-fiend Jorge ‘El Pisao’ and young-at-heart veteran cantaor, El Niño de las Almendras, both of whom attract a crowd of local artists to cheer them on. For those wanting some rub-a-dub styley, Upsetter hosts Reggae nights directly after flamenco. Sala Vimaambi is for those who like their flamenco with a bit of David Lynch. Multimedia projections of leaves floating past the Alhambra, contemporary style movement pieces, and poetry from a formidable throaty-voiced compere named Maam. For all its weirdness however, the experimental band has a fantastic singer in José Fernández Heredia, plus the talents of dancer Sara Jiménez. They also have a flautist who might, if you are very lucky, chuck a bit of David Bowie into the bulería. Tapas and a drink included with the price of entry. Coincide your visit with the annual Viene del Sur festival which takes place from January to May, and you will be in for a treat. Funded by the Andalusian government as a means of injecting money and support into home-grown flamenco, the festival has some of the biggest names in Andalusia (and Spain) performing on a tour of the region’s main cities. In Granada, the programme takes place in this bright modern glass fronted theatre, in the residential Realejo district. The 2008 festival kicked off on January 28th with Merche Esmerelda, Belén Maya and Rocío Molina’s piece, Mujeres – now on tour to Sadler’s Wells. The final concert will feature Sevillian dance maestro Javier Barón and takes place on 19th May. Opened only two months ago, this discreet bar is through a dark wooden door cut into a larger set of dark wood gates, which go unnoticed when not manned in the evenings. The peña itself has few charms – except that its cornflower blue interior makes you feel like you’re in an Almodóvar film. The resident Luis Córdoba group plays every Friday and Saturday. Bailaora Almudena Romero, a dancer since the age of 5, has the power to leave her audience scraping their jaws up off the floor night after night – run and hide before the finale because she likes to make her adoring public dance with her. Most guide books would these days probably warn you off going to a tablao, their reputation sullied by overpriced shows and overworked performers. Not so for Tablao Albayzín – it’s on good authority from both artists and locals that this cosy cave perched near the Mirador de San Cristóbal always puts on a cracking show. At €28 the entry fee is high however, so it would be worth checking with the locals that there’s a good name on before you roll up. Flamenco shows every night, entry €28 includes walking tour of the Albaicín and first drink. La Tertulia tends to attract a hip young crowd of locals which means that when there is a show, the spontaneous audience cameos are fantastic. This bohemian haunt hosts a variety of music and theatre nights. La Tertulia tends to attract a hip young crowd of locals which means that when there is a show, the spontaneous audience cameos are fantastic. Especially good when Grupo de José Candela is performing. Ask an authority on flamenco and they’ll tell you that it can’t be bought, only found. If you want to witness a bulería in its purest form but don’t have time to sit around waiting to be invited to a gypsy wedding, head to Café Elvira where it’s likely that the locals will be whipping up a ramshackle zambra. They don’t put on official concerts, however the bar is a firm favourite of musicians, hippies, and artists who love to make their own spontaneous spectacles. Be warned, it’s also beloved by Granada’s large hash-smoking community.